Flower: 1/16 in. (2 mm.) long green-white flowers, growing from a long spike. Leaf: 6 in. (15 cm.) long, 4 in. (10 cm.) wide, dark green, ovate leaves, growing in a basal rosette on the ground. Leaves often possess a waxy texture. Plant: 6  18 in. (15  45 cm.) tall, with most of the height contained in the flower spike. Identifying Characteristics: The ovate leaves with distinctive parallel veins, and the relatively tall green flower stalk identify Common Plantain. Location: The Common Plantain pictured here grew on the Brandeis University campus in the wetland area behind the Goldfarb library. History and Comments: Common Plantain is native to Europe, and it is considered a weed. It very commonly grows in lawns and gardens, preferring nutrient rich soils to those along roadsides, or other disturbed uninviting sites. 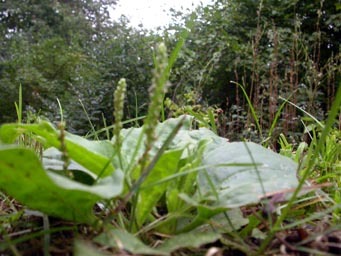 Common Plantain can tolerate close lawn mowing and can survive in both dry and wet soils.